Well who would have guessed a new brewery would open up in the Vancouver area? Not me for sure I mean there isn’t a craft beer revolution going on here or anything! Ok so I am full of it. 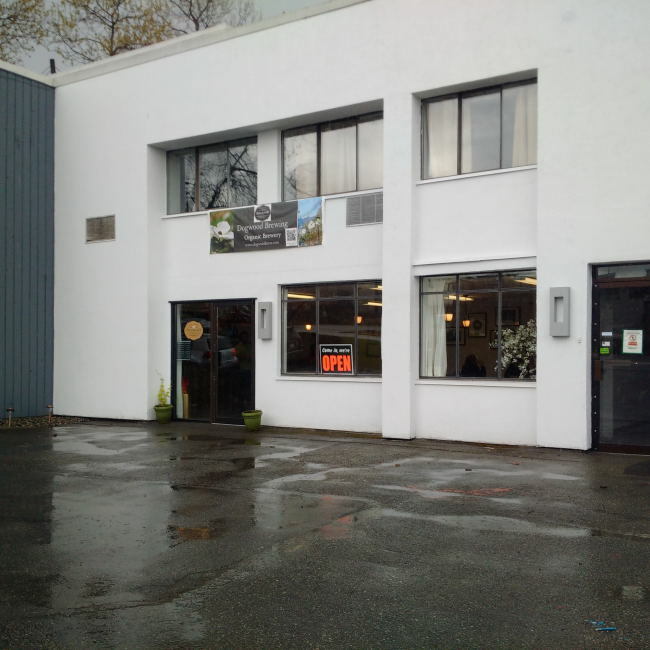 South Vancouver now has a brewery to call its own just blocks off of Marine Way close to Knight Street. Just to kick the trend in beer lately this brewery is helmed by a female head brewer! Head Brewer Claire Connolly was formerly the head brewer at Big River Brewpub in Richmond and has worked at breweries in the UK also. Not only have they kicked the trend of Male head brewers but they are also using different ingredients than most breweries. Dogwood Brewing only uses Organic ingredients. They get their malts from Gambrinus Malting Corporation in Armstrong BC and their hops from HOOH Hops Inc (Harvesters of Organic Hops) in Lillooet BC. This is the first Organic brewery in Vancouver and only the third in the province with Nelson Brewing Company and Crannóg Ales being the other two. When you walk into the brewery you find a nice big space with lots of table space and a bar where you can order your beer and growler fills. Currently they only have the tasting room license but I would assume from the layout they will be going for their lounge license also. There is just too much seating to not plan to have people stick around for more than one flight or 12oz glass of beer. 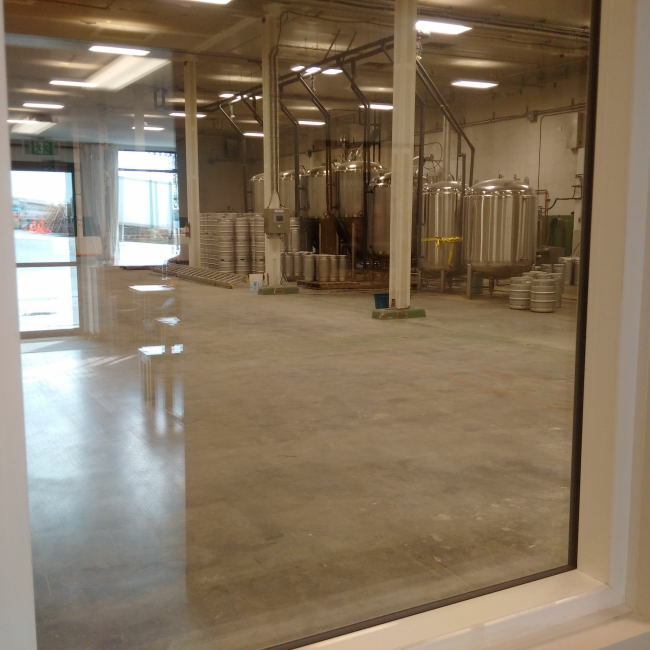 When you are in the tasting room there is a nice little peek-through window where you can see the brewery in all its small glory. I was lucky enough to run into Claire Connolly while I was at the brewery for my first visit and she was happy to give me a tour of the brewery. She showed off the hops and malts that she is using that are certified organic and then took me though the brewery itself. In my opinion being fairly in the know in the craft beer community in BC I think Dogwood Made a very good decision to get a space that was currently to big for their capacity. It may currently look cavernous but thing always grow in Vancouver and they are already planning their next tank purchases and they just opened a few days ago. If you look at the trend in Metro Vancouver you will see a massive growth in breweries be it Powell Street and Bridge Brewing or even Central City Brewers & Distillers. No matter your current space you will probably end up out growing it and depending now small you go your first brewery move may only be years away. Unless Dogwood explodes like Parallel 49 Brewing I think this space should be great for years to come. Dogwood may even be limited on growth depending on just how much Organic ingredients they can procure on a year to year basis. But if you are into Organic ingredients I recommend that you head to Dogwood Brewing as soon as possible and check out what they are doing! Well when it comes down to it I recommend everyone head out and try out their take on local craft beer really! Check out full sized photos here. This entry was posted in Brewery and tagged armstrong, bc, beer, brewery, canada, craft beer, dogwood brewing, gambrinus malting corporation, harvesters of organic hops, hooh hops inc, lilooet, organic, organic hops, organic malts, south vancouver, tasting room, vancouver.